Bowling Green is gearing up to celebrate Duncan Hines’ birthday month! Our monthly #gearedforgiveaways contests are officially kicking off in 2015 this month with a Duncan Hines themed package! The lucky winner will receive a copy of “Adventures in Good Cooking,” a 2014 Duncan Hines Festival t-shirt, a Duncan Hines spatula and 1 complimentary night’s stay at the Hampton Inn Bowling Green. Originally published in 1933, “Adventures in Good Cooking” is filled with pages of outstanding recipes from the finest kitchens in America. Eating on the road was a passion for our native Duncan Hines and he wanted to share his favorite extraordinary dishes. Hines was given the opportunity to eat at several locations during his time spent as a traveling salesman in the 1940’s. He first published “Adventures in Good Eating,” which recommended various places to eat to his fellow travelers. This book led to the writing of “Adventures in Good Cooking,” which highlights the best recipes from restaurants he recommended in his previous book. Most of the chefs and owners were so appreciative to be recognized by Hines in his publications, they didn’t mind sharing the secrets of their finest known dishes. Though recipes in this book may not be trendy in the 21st century, they are nothing but timeless and remain loved by all. Some of the favorites include Lindy’s Cheesecake from New York and Ham Pie with Cheese Biscuit Top from the Anderson Hotel of Wabasha. Being a famed food critic, Hines earned his title of being one of the most trusted names in the food industry, which eventually led to the Duncan Hines label being associated with all sorts of kitchenware, including the famous cake mix. What better way to celebrate his birthday than bringing all foodies together for the annual Duncan Hines Festival? Families bring the kids for Uncle Duncan’s Duck Derby, the Adventures in Good Baking Contest and more at Chaney’s Dairy Barn right here in Bowling Green on July 11, 2015. If you can’t make the festival, still celebrate our beloved Duncan Hines by visiting the “Recommended by Duncan Hines” exhibit at the Kentucky Museum, or travel the Duncan Hines Scenic Byway along historic Highway 68. What about that #gearedforgiveaways contest? Like us on Facebook and follow us for updates! The contest and directions to enter will go live on Friday, March 20 and the winner will be announced on Thursday, March 26—Duncan Hines’ birthday. 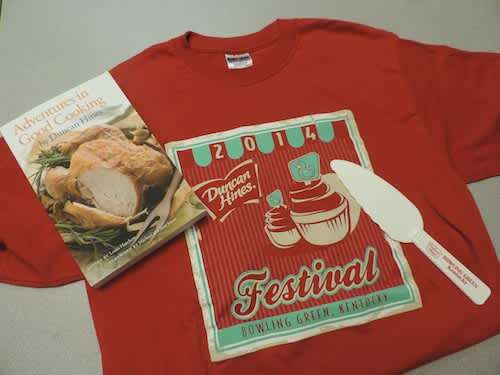 You’ll want to win “Adventures in Good Cooking,” a 2014 Duncan Hines Festival t-shirt, a Duncan Hines spatula and 1 complimentary night’s stay at the Hampton Inn Bowling Green. Gear up and celebrate Duncan Hines’ birthday with us, after all, he has always been there to celebrate yours!